Jim Schwartz inherited a talented, but under-performing defense and turned it into one of the best in the NFL. Now that the Philadelphia Eagles' offseason is (finally) underway, let's take a look at each position and figure out which players will be back in 2018, and which ones will be playing elsewhere. Here we'll look at the defensive coordinator. In the Eagles' win over the Patriots in the Super Bowl, Tom Brady did whatever he wanted to Schwartz's defense for the entirety of the second half, until Brandon Graham made the play of his life working against Pats RG Shaq Mason from a defensive tackle pass rushing position. Graham's strip sack is one of the lasting images of the Eagles' Super Bowl winning season, but Schwartz's defense will also be remembered for allowing 505 passing yards to Tom Brady, and 613 yards of total offense. It's a shame for Schwartz that many will remember his defense for that, because his unit was unquestionably among the best in the NFL up until that point. Leading up to the Eagles' NFC Championship Game matchup against the Minnesota Vikings, much was made of the Vikings' No. 1 ranked defense. We made the argument that the Eagles' defense was every bit as good. As you can see, the Vikings' defense was in the top five in almost every major statistical category, with three exceptions. The Eagles cracked the top five in nine of the 14 categories shown above. However, the one glaring statistic where the Vikings weren't particularly impressive is takeaways. On the season, the Vikings produced 19 turnovers, which was good for 23rd in the NFL. The Eagles produced 31 turnovers, fourth in the NFL, and one turnover shy of averaging two per game. On average, the Eagles produced 1.94 turnovers per game, vs. 1.18 for the Vikings'. A difference of 0.76 takeaways per game is substantial, while a difference of 30.6 yards allowed per game is not. The Eagles also scored six defensive touchdowns during the regular season, as compared to one for the Vikings. On the premise that the Eagles made substantially more big plays than the Vikings, in my view, they were right there with them in terms of overall performance. In that game, as you saw, the Eagles got a huge defensive play from Patrick Robinson, who returned an interception for a score, and the Vikings were held to 7 points. And it's not really as if his players have changed dramatically. Six of Schwartz's starters in 2017, basically the core of the defense, were on the roster in 2015. They were Fletcher Cox, Brandon Graham, Vinny Curry, Jordan Hicks, Mychal Kendricks, and Malcolm Jenkins. #JimmyVerdict: Unless some other newly hired head coach around the league decides to slither back to his old team like Josh McDaniels did, Schwartz isn't going anywhere. 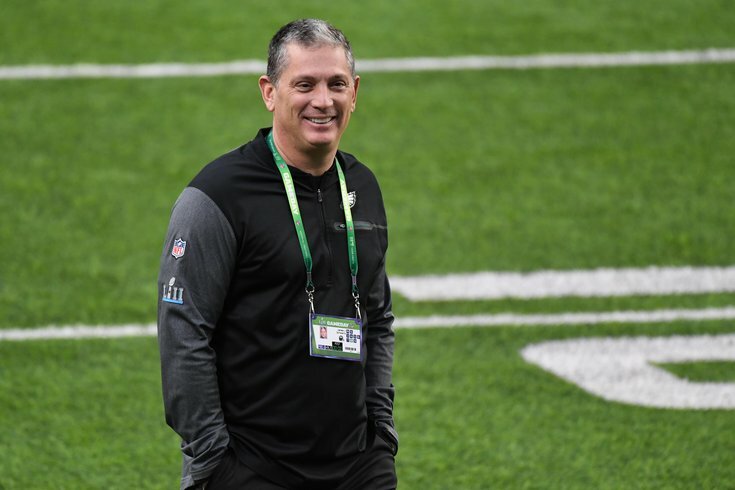 Jim Schwartz: Stay or Go?